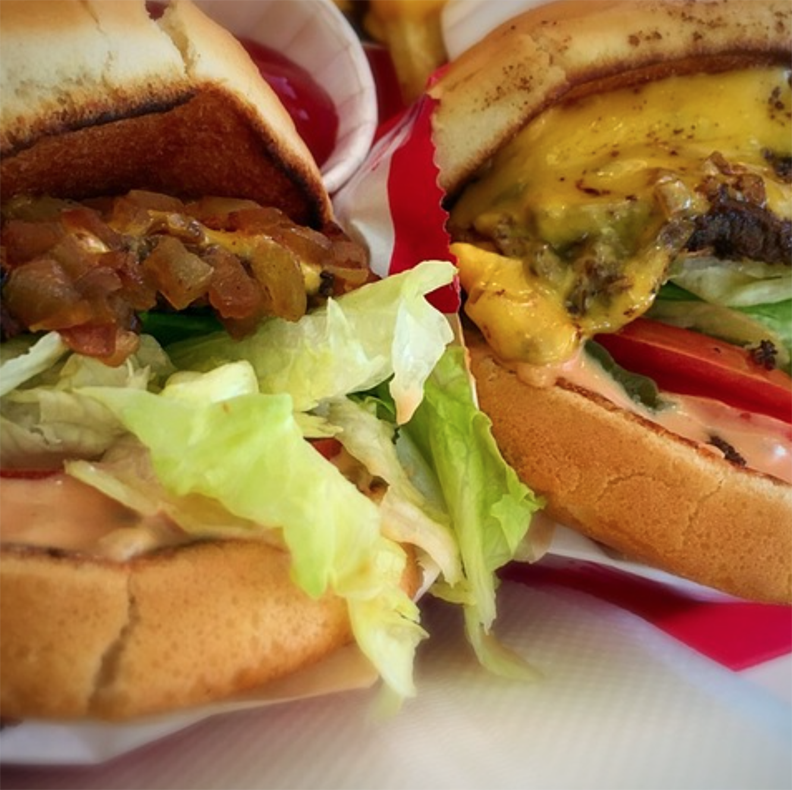 No, eating the occasional hamburger is not going to automatically trigger significant health issues when we get older (and yes, that burger up there does look delicious). But a consistent diet of food that is cheaply made with ingredients that lack integrity and are sprayed with pesticides will. Fast food, highly processed foods and conventional produce may seem like the cheaper option, but they’ll likely cost a pretty penny down the line when we start facing health problems that we’ll pay for in lifestyle, as well as in medical bills. Many of us are prone to purchase the least expensive option available—why pay more when we can pay less, right? But the inexpensive option might not seem so cheap once we factor in all of the delayed costs one will face in the future. According to research from the McKinsey Global Institute, obesity results in healthcare costs of $2 billion dollars annually. And the Union of Concerned Scientists reports that if we consumed the recommended amount of produce it would save $27 billion in healthcare costs each year, as well as 127,000 lives. According to the World Health Organization pesticide poisoning is the cause of 20,000 deaths, and affects 3 million people annually. And a study out of Iowa State University shows that we pay $1 billion per year in health costs from pesticides. One of the common herbicides used on conventional crops was even declared to be a probable carcinogen by the WHO last year, yet we eat those crops! If you knew that you could pay $1 more for an organic apple now, and not have to pay thousands upon thousands of dollars and be sick later, would you? Most likely yes, but not everyone has that extra dollar in their pocket to spend. It’s a systemic issue—low wages, subsidies for some crops but not others, misleading marketing, support of Big Ag… There are many elements to blame. But we are seeing some progress—minimum wage increase, discussion surrounding subsidies, and fast food chains eliminating antibiotic-fed meats… And an increased awareness surrounding heath costs that result from a poor diet. Knowing is half the battle, so spread the word! And share your good-for-you eats on the Foodstand app. Join us in the fight for good food. For scallops: Place on a paper towel and pat dry. Season with a little salt and pepper. Heat 1 tbsp extra virgin olive oil in a skillet over medium-high heat. Place scallops in the skillet and cook until golden brown—about 3 minutes/side—and depending on how thick the scallop is. For mushrooms: Sauté mushrooms in 1 tbsp of olive oil for 3-4 minutes. Salt and pepper them. Adding herbs, such as thyme, is optional. For corn mash: Boil two small potatoes, remove from pot and drain. Take fresh corn and simmer in ghee until soft. Mash potatoes and corn together in with the ghee. Salt to taste. 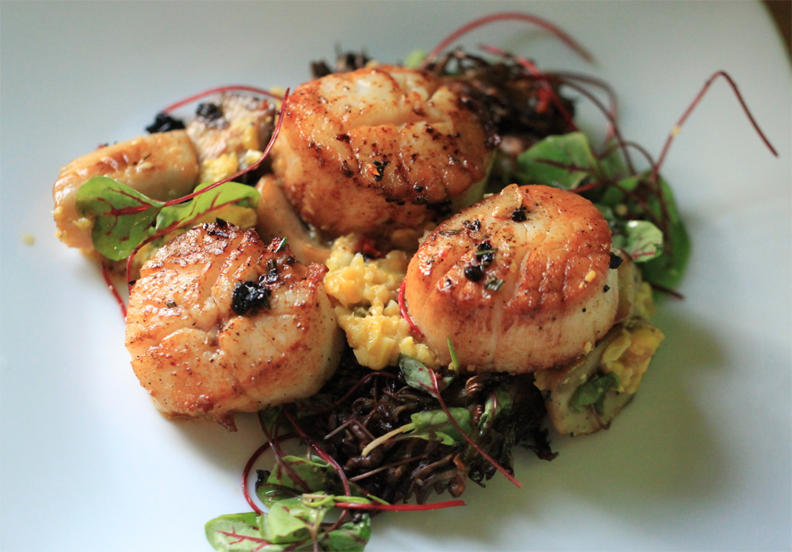 Plate scallops over the mushrooms, mashed corn and red-veined sorrel. Set a pot of water on the stove to boil, and preheat the oven to broil. Toss the shrimp with olive oil, a few dashes of cayenne pepper, sea salt and freshly ground black pepper. Arrange on a sheet pan in a single layer, and set aside. Make the peanut sauce by whisking together the ginger, garlic, 2 teaspoons sesame oil, peanut butter, apple cider vinegar, lime juice, Bragg’s and cayenne pepper. Set aside. Combine the cucumber and carrot sticks in a small bowl, and set aside. Combine the cilantro, mint and scallions in a small bowl and set aside. Place the the shrimp into the oven, and cook until opaque. While they cook, add a splash of olive oil and the bok choy to a large skillet over medium heat. Sauté for a few minutes until slightly tender, then remove from the heat. Meanwhile, add the vermicelli to the boiling water and cook for about 2 minutes. Drain, and toss with the remaining tablespoon of sesame oil. Assemble by placing a scoop of noodles onto a plate. Top with bok choy, a couple spoonfuls of the carrots and cucumbers, and a generous serving of the herbs. 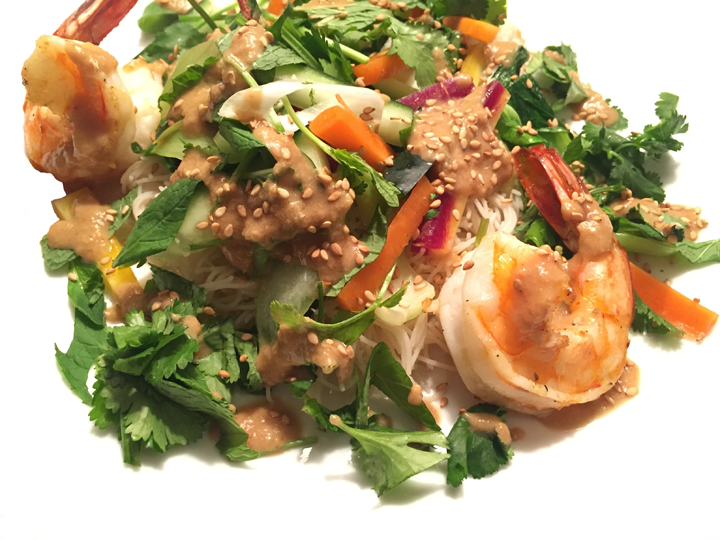 Add three shrimp around the plate, and drizzle with peanut sauce. Garnish with sesame seeds, and serve.